Parkinson's disease (PD) is a chronic neurodegenerative disease that places a substantial burden on patients, their families, and their caregivers, as well as on society as a whole. The progressive decline in motor function and the comorbidities associated with PD negatively affect health-related quality of life (HRQoL) . Subthalamic nucleus deep brain stimulation (STN-DBS) is the most common surgical procedure for PD. HRQoL significantly improved in the majority of patients who underwent STN-DBS , but not in all items of HRQoL . However, when using patient-based self-assessment scales, the clinical benefits imparted by STN-DBS were more subtle: physical components related to HRQoL significantly improved, whereas the mental components of HRQoL, such as emotional well-being, social support, and communication, did not show consistently remarkable improvement . Clinical evaluation of PD typically encompasses a variety of functional and mental assessments, in addition to data gathered during patient examinations. The Core Assessment Program for Surgical Interventional Therapy (CAPSIT) protocol  recommends that patients complete questionnaires assessing HRQoL before starting preoperative evaluations and at 6 months, 1 year, and 2 years postsurgery, and once a year thereafter if evaluation is continued. PD patients are particularly vulnerable to deterioration of HRQoL resulting from both motor disability and nonmotor symptoms. Motor improvement in PD patients by STN-DBS is sustained for up to 5–8 years after surgery,. Lyons and Pahwa found that while some early improvements in motor disability deteriorated over time , significant improvements in HRQoL following STN-DBS were strongly correlated with improvement in motor function . On the contrary, some studies showed that the psychiatric symptoms following STN-DBS were not correlated with improvement in HRQoL [10-12]. Another randomized trial documented that amelioration in mood symptoms, such as anxiety, paralleled the improvement in HRQoL . Owing to the lack of consensus regarding correlation between changes in HRQoL and symptoms following STN-DBS, further investigation is needed . Moreover, self-assessed health status may provide a more referable predictor of outcome than many objective measures of health. Improvements in HRQoL are usually reported as a summary score in clinical trials for PD,. It is necessary to improve our understanding of which components of HRQoL and clinical symptoms are affected by treatment. There are few reports regarding HRQoL and motor and depressive symptoms following STN-DBS, particularly in Asian patients, who have different cultural backgrounds, perceptions, and needs than Western patients. In the current study, we aimed to compare each domain of HRQoL and motor and depressive symptoms in patients with PD at baseline and 1 year after STN-DBS surgery and identify significant factors that impact quality of life following surgery. The current study utilized a prospective, observational cohort design to evaluate changes in HRQoL and in motor and depressive symptoms of PD patients from baseline through 1 year after bilateral STN-DBS surgery. This study was conducted at a medical center in Taiwan. From July 2011 to June 2014, 33 Taiwanese PD patients who underwent STN-DBS surgery were enrolled in our study. PD was diagnosed according to the United Kingdom PD Society Brain Bank criteria . As described in detail previously , the inclusion criteria were as follows: (1) idiopathic PD; (2) a good levodopa response on the Unified PD rating scale (UPDRS) Part III (>28% improvement in Part III scores); and (3) the presence of drug-related complications (e.g. dyskinesia, “on-off” phenomenon, or psychiatric symptoms), even under optimal anti-parkinsonian medication adjustments. The exclusion criteria were as follows: (1) dementia, as defined by a mini-mental state examination score <24; (2) structural lesions in the brain identified by magnetic resonance imaging (MRI) or computerized tomography (CT); and (3) contraindications for surgery. The current study was approved by the Tzu Chi Hospital Ethical Committee (IRB097-32). The enrolled patients can understand the benefits and risks of STN-DBS before undergoing surgery, and the decision to pursue surgery was reached by consensus with the clinical team and patient. All patients provided written informed consent before data collection. Before the operation, cranial images were obtained with a 1.5-Tesla MRI machine (General Electric, Rahway, NJ, USA). The standard settings included T1-weighted axial images at a 0.75-mm thickness, T2-weighted axial images at a 2-mm thickness, and T1-weighted images with contrast (delineation of vasculature in cases of injury). Each of these sequences was performed in contiguous axial slices. The images were transferred to a Stealth neuronavigation workstation (Medtronic, Minneapolis, MN, USA). The image fusion software fused all three sets of MR images. The surgical target coordinates for the tip of the permanent implantable electrode were set at the center of the STN by direct visualization from brain MRI (direct targeting) and adjusted according to the relative position of the anterior commissure–posterior commissure line and red nucleus (indirect targeting). On the morning of the operation, a Leksell G-frame (Elekta Instrument Inc., Norcross, GA, USA) was applied under local anesthesia with the patient sitting in a chair. Patients were then given CT examinations. The CT images were fused on the preoperative MRI to determine target coordinates. During neurophysiological mapping, neural firings obtained from the tip of the microelectrode (FHC, Bowdoin, ME, USA) were sent to the intraoperative microelectrode recording system (Leadpoint; Medtronic) where they were magnified and displayed. The selection of the final trajectory for electrode implantation (Medtronic 3389 DBS leads) depended on adequate length of STN hyperactivity neuronal firing and the presence of movement-related firing pattern changes. Brain CT imaging was obtained immediately after the operation to exclude intracranial hemorrhage and to localize the postoperative electrode. A pulse generator was usually implanted 1 week after electrode implantation. A postoperative active stimulation test was performed to identify the maximal effectiveness of contact and related adverse effects. Detailed surgical procedures have been described in a previous report . The HRQoL survey was assessed according to the PD questionnaire-39 (PDQ-39) score, which is a disease-specific measurement instrument for patients with PD. A higher score signifies a poorer quality of life . The Chinese version of the PDQ-39 has been shown to be a reliable instrument . This self-assessment was performed before surgery and at 1 year after STN-DBS surgery. The UPDRS was used to follow the longitudinal course of PD. A nursing specialist scored patients on a scale from 0 to 199. A higher score indicates worse function . 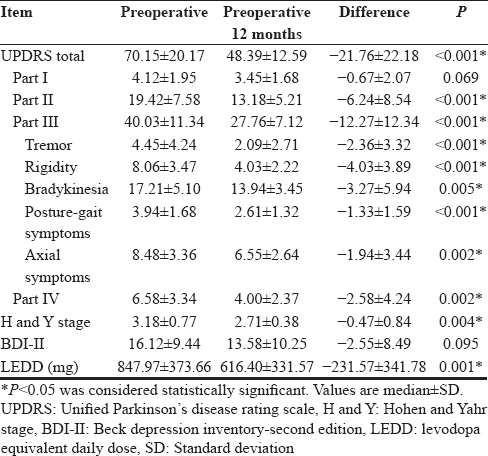 The presurgery UPDRS Part III motor evaluation was performed for each patient after they achieved an off-medication condition, which was the withdrawal of dopaminergic medication for at least 12 h, as defined by the CAPSIT protocol for PD . The same assessments were performed postoperatively under off-medication conditions with bilateral STN-DBS on. UPDRS Part III motor scores were separately assessed for tremor items 20–21, rigidity item 22, bradykinesia items 23–26 and 31, posture-gait items 28–29, and axial items 18 and 27–30. The Hoehn and Yahr (H and Y) stage classifies patients with PD into one of the five different stages according to their bodily distributions of symptoms and level of dependency . While the original scale included stages 1 through 5, in the 1990s, 0.5 increments were introduced for some clinical trials . The Beck Depression Inventory-II (BDI-II) is one of the most widely used instruments for measuring the severity of depression. A previous cluster analysis demonstrated that the BDI is a valid instrument for quantifying depression in PD patients . The BDI-II contains 21 questions, and each answer is scored on a scale of 0–3. Scores of 0–13 indicate minimal depression; 14–19, mild depression; 20–28, moderate depression; and 29–63, severe depression . The total levodopa equivalent daily dose (LEDD) was calculated according to the accepted equivalence between different dopaminergic drugs . All descriptive data are presented as the median ± standard deviation (SD). Because normality could not be observed for the relatively small group of patients, nonparametric testing was used. The Wilcoxon matched-pairs signed-rank test was used to compare the variables measured at baseline and 1 year after surgery; these variables included the UPDRS score, H and Y stage, BDI-II score, LEDD, and PDQ-39 score. P < 0.05 was considered statistically significant. The relative magnitude of changes in HRQoL was standardized to percentages by applying the following formula: magnitude of the change (%) = (final value − baseline value) ×100/baseline value. A generalized linear model was used to predict the postoperative HRQoL from each preoperative characteristic. Thirty-three patients with PD were included and completed the follow-up in the study. Details of the baseline characteristics of patients are given in [Table 1]. Women participants reported more problematic HRQoL and had more motor difficulties in daily living and experienced significantly more stigma than men. One year after STN-DBS surgery, there was a significant overall improvement in HRQoL (21.43%). 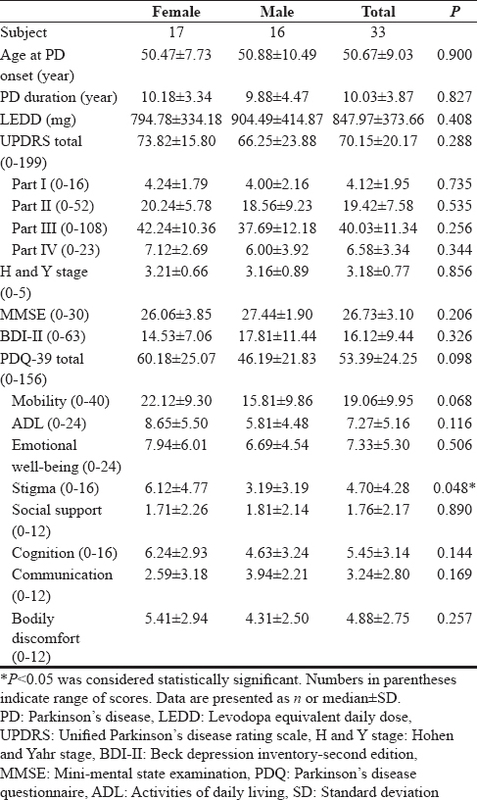 Among the PDQ-39 individual domains, significant improvements were found for mobility, ADL, emotional well-being, and bodily discomfort, but not for stigma, social support, cognition, or communication [Table 2]. In terms of clinical effectiveness, the patients showed a 34.92% improvement in PD status, as measured by UPDRS total scores and a 30.56% improvement in UPDRS Part III scores after STN-DBS [Table 3]. There were significant improvements in the UPDRS Part II (38.46%) and IV (44.16%) scores under off-medication/on-stimulation conditions at the 1-year follow-up, while no significant improvements were found in UPDRS Part I. Some individual variables of UPDRS Part III also showed significant improvements 1 year postsurgery, including tremor (48.77%), rigidity (41.44%), bradykinesia (10.50%), posture-gait symptoms (26.62%), and axial symptoms (14.94%). Significant improvements were also observed in the H and Y stage. In terms of depressive symptoms, patients had BDI-II scores of 16.2 ± 9.44 (median ± SD) at baseline and 13.58 ± 10.25 at 1 year, with no statistically significant changes between assessments. Significant reductions in medication of up to 27.36% were observed in LEDD values at 1 year postsurgery compared with preoperatively. We performed generalized linear model analysis to clearly illustrate that preoperative factors might influence postoperative HRQoL after STN-DBS. Of the clinical parameters examined, the preoperative PDQ-39 total score and LEDD at baseline were significantly correlated with the postoperative PDQ-39 score (R2 = 0.519) [Table 4]. The positive standardized beta values show that patients with worse preoperative HRQoL (higher PDQ-39 total scores) and higher levodopa doses had worse HRQoL outcomes 1 year after STN-DBS. Our study aimed to explore the impact of surgery on both motor and depressive symptoms and indicate the potential influence of some of these clinical features or factors on postoperative HRQoL. 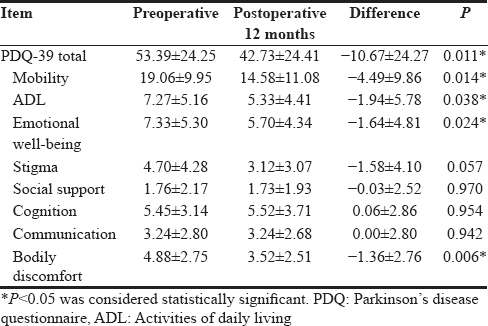 There was significant improvement in overall quality of life at 1 year after surgery, similar to other reports concerning PDQ-39 score changes after STN-DBS surgery,,,. Nonetheless, when we analyzed PDQ-39 domains separately, the benefits with respect to baseline improved for only mobility (30.77%), activities of daily living (42.11%), emotional well-being (33.33%), and bodily discomfort (33.33%), but not for the domains of stigma, social support, cognition, and communication. These findings are consistent with the previous studies of STN-DBS for PD that included PDQ-39 subscale data,,. These results may have arisen because the patients were aware that STN-DBS was not curative and that their underlying disease would continue to progress,. Stereotypes, misunderstandings, shame, isolation, discrimination, and stigmatization are silent and partly invisible phenomena, which must be considered. The absence of significant improvements in social support likely reflects the static natures of the patients' social networks following surgery. PD negatively influences the social domain of HRQoL, which partially arises due to embarrassment associated with PD symptoms and difficulties in communication and coping with stigma. Our study showed a reduction of 10.67 ± 24.27 points in the PDQ-39 total score from baseline to 12 months postsurgery. This was in accordance with previous studies evaluating HRQoL after STN-DBS surgery,. Compared with the extent of HRQoL improvement in DBS reported by Witt et al., our study showed a lower median reduction in the total PDQ-39 score and this difference may have been associated with our small sample size and more variations in PDQ-39 scores obtained after surgery. The findings that the preoperative PDQ-39 total score and LEDD predicted postoperative HRQoL in PD following STN-DBS are consistent with a previous report . No significant correlations were found between preoperative UPDRS scores, H and Y stage, BDI-II scores, and postoperative PDQ-39 scores in PD patients following STN-DBS. In the current study, 10 (30.3%) patients showed improvements in disease status and severity, but there was deterioration in the HRQoL score after 1 year. This discrepancy may have resulted because the operation outcomes did not meet the patients' expectations of returning to a normal life; such disappointment may affect self-perception and HRQoL . In addition, HRQoL improved less than the clinical measures of impairment and disability. Based on a previous report by Schrag et al., we reasoned that this might be due to the difference between the impacts on objective motor impairment as measured by the UPDRS versus the subjectively evaluated HRQoL. The preoperative LEDD was significantly associated with postoperative HRQoL after STN-DBS surgery. It seemed reasonable that a higher preoperative LEDD had a negative influence on the postoperative HRQoL. A higher LEDD is associated with a higher risk of levodopa-related motor complications. Previous studies have shown that a diagnosis of depression is a significant prognostic factor in the improvement of quality of life after DBS,. There was no remarkable change in BDI-II scores after STN-DBS in our study, which might have resulted from the low BDI-II scores in recruited patients. Another study showed that the prevalence of moderate or severe depression might reach 52% in PD patients . The results of this study highlight the need to identify and treat depression in PD, especially for those who are considering STN-DBS. This will maximize the benefits of surgery. Health-care professionals should be aware of not only motor dysfunction but also nonmotor problems affecting the lives of individuals with PD. The complexity of HRQoL as a whole is the main limitation of this study, as HRQoL is potentially affected by many different variables, including individual coping strategies, experience of spouses and caregivers, and socioeconomic status, which are not measured in the PDQ-39 . Furthermore, we did not include a control group of patients with PD who did not undergo surgery. The information gained from our study and others will enable health-care professionals to become more attuned to the visible and invisible manifestations of PD that are associated with motor and psychiatric symptoms through the incorporation of multidisciplinary assessments to identify the needs of individuals living with this disease. HRQoL assessment should be an integral component of the clinical protocol used for patients with PD who consider STN-DBS. Bilateral STN-DBS surgery successfully improved global HRQoL as well as reduced motor impairment, disease severity, and medication dosage at 12 months after surgery. Worse preoperative PDQ-39 scores and higher LEDD predicted worse HRQoL at 1 year after surgery. The authors would like to warmly acknowledge the patients and caregivers who participated in this research with dedication. Dowding CH, Shenton CL, Salek SS. A review of the health-related quality of life and economic impact of Parkinson's disease. Drugs Aging 2006;23:693-721. Jiang JL, Lo SF, Tsai ST, Chen SY. A systematic review of the impact of subthalamic nucleus stimulation on the quality of life of patients with Parkinson's disease. Tzu Chi Med J 2014;26:5-20. Smeding HM, Speelman JD, Huizenga HM, Schuurman PR, Schmand B. Predictors of cognitive and psychosocial outcome after STN DBS in Parkinson's disease. J Neurol Neurosurg Psychiatry 2011;82:754-60. Hasegawa H, Samuel M, Douiri A, Ashkan K. Patients' expectations in subthalamic nucleus deep brain stimulation surgery for Parkinson disease. World Neurosurg 2014;82:1295-9. Defer GL, Widner H, Marié RM, Rémy P, Levivier M. Core assessment program for surgical interventional therapies in Parkinson's disease (CAPSIT-PD). Mov Disord 1999;14:572-84. Schüpbach WM, Chastan N, Welter ML, Houeto JL, Mesnage V, Bonnet AM,et al. Stimulation of the subthalamic nucleus in Parkinson's disease: A 5 year follow up. J Neurol Neurosurg Psychiatry 2005;76:1640-4. Fasano A, Romito LM, Daniele A, Piano C, Zinno M, Bentivoglio AR,et al. Motor and cognitive outcome in patients with Parkinson's disease 8 years after subthalamic implants. Brain 2010;133:2664-76. Jiang JL, Chen SY, Hsieh TC, Lee CW, Lin SH, Tsai ST,et al. Different effectiveness of subthalamic deep brain stimulation in Parkinson's disease: A comparative cohort study at 1 year and 5 years. J Formos Med Assoc 2015;114:835-41. Lyons KE, Pahwa R. Long-term benefits in quality of life provided by bilateral subthalamic stimulation in patients with Parkinson disease. J Neurosurg 2005;103:252-5. Floden D, Busch RM, Cooper SE, Kubu CS, Machado AG. Global cognitive scores do not predict outcome after subthalamic nucleus deep brain stimulation. Mov Disord 2015;30:1279-83. Okun MS, Fernandez HH, Wu SS, Kirsch-Darrow L, Bowers D, Bova F,et al. Cognition and mood in parkinson's disease in subthalamic nucleus versus globus pallidus interna deep brain stimulation: The COMPARE trial. Ann Neurol 2009;65:586-95. Zibetti M, Torre E, Cinquepalmi A, Rosso M, Ducati A, Bergamasco B,et al. Motor and nonmotor symptom follow-up in Parkinsonian patients after deep brain stimulation of the subthalamic nucleus. Eur Neurol 2007;58:218-23. Witt K, Daniels C, Reiff J, Krack P, Volkmann J, Pinsker MO,et al. Neuropsychological and psychiatric changes after deep brain stimulation for Parkinson's disease: A randomised, multicentre study. Lancet Neurol 2008;7:605-14. Lezcano E, Gómez-Esteban JC, Tijero B, Bilbao G, Lambarri I, Rodriguez O,et al. Long-term impact on quality of life of subthalamic nucleus stimulation in Parkinson's disease. J Neurol 2016;263:895-905. Daniels C, Krack P, Volkmann J, Raethjen J, Pinsker MO, Kloss M,et al. Is improvement in the quality of life after subthalamic nucleus stimulation in Parkinson's disease predictable? Mov Disord 2011;26:2516-21. Schüpbach WM, Maltête D, Houeto JL, du Montcel ST, Mallet L, Welter ML,et al. Neurosurgery at an earlier stage of Parkinson disease: A randomized, controlled trial. Neurology 2007;68:267-71. Chen SY, Tsai ST, Hung HY, Lin SH, Pan YH, Lin SZ,et al. Targeting the subthalamic nucleus for deep brain stimulation – a comparative study between magnetic resonance images alone and fusion with computed tomographic images. World Neurosurg 2011;75:132-7. Peto V, Jenkinson C, Fitzpatrick R, Greenhall R. The development and validation of a short measure of functioning and well being for individuals with Parkinson's disease. Qual Life Res 1995;4:241-8. Ma HI, Hwang WJ, Chen-Sea MJ. Reliability and validity testing of a Chinese-translated version of the 39-item Parkinson's disease questionnaire (PDQ-39). Qual Life Res 2005;14:565-9. Martínez-Martín P, Gil-Nagel A, Gracia LM, Gómez JB, Martínez-Sarriés J, Bermejo F,et al. Unified Parkinson's disease rating scale characteristics and structure. The cooperative multicentric group. Mov Disord 1994;9:76-83. Goetz CG, Poewe W, Rascol O, Sampaio C, Stebbins GT, Counsell C,et al. Movement disorder society task force report on the Hoehn and Yahr staging scale: Status and recommendations. Mov Disord 2004;19:1020-8. Levin BE, Llabre MM, Weiner WJ. 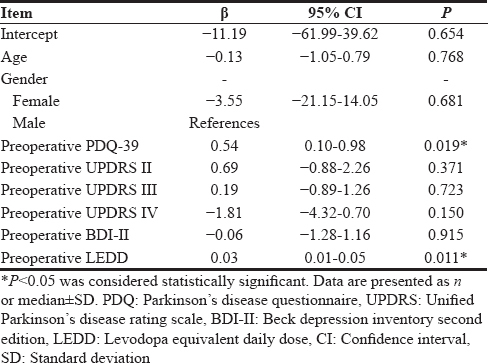 Parkinson's disease and depression: Psychometric properties of the beck depression inventory. J Neurol Neurosurg Psychiatry 1988;51:1401-4. Tomlinson CL, Stowe R, Patel S, Rick C, Gray R, Clarke CE,et al. Systematic review of levodopa dose equivalency reporting in Parkinson's disease. Mov Disord 2010;25:2649-53. Sobstyl M, Ząbek M, Górecki W, Mossakowski Z. Quality of life in advanced Parkinson's disease after bilateral subthalamic stimulation: 2 years follow-up study. Clin Neurol Neurosurg 2014;124:161-5. Schuepbach WM, Rau J, Knudsen K, Volkmann J, Krack P, Timmermann L,et al. Neurostimulation for Parkinson's disease with early motor complications. N Engl J Med 2013;368:610-22. Williams A, Gill S, Varma T, Jenkinson C, Quinn N, Mitchell R,et al. Deep brain stimulation plus best medical therapy versus best medical therapy alone for advanced Parkinson's disease (PD SURG trial): A randomised, open-label trial. Lancet Neurol 2010;9:581-91. Deuschl G, Schade-Brittinger C, Krack P, Volkmann J, Schäfer H, Bötzel K,et al. Arandomized trial of deep-brain stimulation for Parkinson's disease. N Engl J Med 2006;355:896-908. Drapier S, Raoul S, Drapier D, Leray E, Lallement F, Rivier I,et al. Only physical aspects of quality of life are significantly improved by bilateral subthalamic stimulation in Parkinson's disease. J Neurol 2005;252:583-8. Just H, Ostergaard K. Health-related quality of life in patients with advanced Parkinson's disease treated with deep brain stimulation of the subthalamic nuclei. Mov Disord 2002;17:539-45. Schüpbach M, Gargiulo M, Welter ML, Mallet L, Béhar C, Houeto JL,et al. Neurosurgery in Parkinson disease: A distressed mind in a repaired body? Neurology 2006;66:1811-6. Ahlberg E, Laakso K, Hartelius L. Perceived changes in communication as an effect of STN surgery in Parkinson's disease: A qualitative interview study. Parkinsons Dis 2011;2011:540158. Witt K, Daniels C, Krack P, Volkmann J, Pinsker MO, Kloss M,et al. Negative impact of borderline global cognitive scores on quality of life after subthalamic nucleus stimulation in Parkinson's disease. J Neurol Sci 2011;310:261-6. Floden D, Cooper SE, Griffith SD, Machado AG. Predicting quality of life outcomes after subthalamic nucleus deep brain stimulation. Neurology 2014;83:1627-33. Schrag A, Spottke A, Quinn NP, Dodel R. Comparative responsiveness of Parkinson's disease scales to change over time. Mov Disord 2009;24:813-8. Global Parkinson's Disease Survey (GPDS) Steering Committee. Factors impacting on quality of life in Parkinson's disease: Results from an international survey. Mov Disord 2002;17:60-7. Schrag A, Jahanshahi M, Quinn N. What contributes to quality of life in patients with Parkinson's disease? J Neurol Neurosurg Psychiatry 2000;69:308-12. Caap-Ahlgren M, Dehlin O. Insomnia and depressive symptoms in patients with Parkinson's disease. Relationship to health-related quality of life. An interview study of patients living at home. Arch Gerontol Geriatr 2001;32:23-33. Soulas T, Sultan S, Gurruchaga JM, Palfi S, Fénelon G. Depression and coping as predictors of change after deep brain stimulation in Parkinson's disease. World Neurosurg 2011;75:525-32.